Two days after he announced his engagement, Prince William helped rescue a man suffering from a suspected heart attack on Mount Snowdon in Britain, reports the AFP. Part of a four-man crew, the prince--a Royal Air Force search and rescue pilot--flew the helicopter in stormy weather to help save gym worker Greg Watkins. 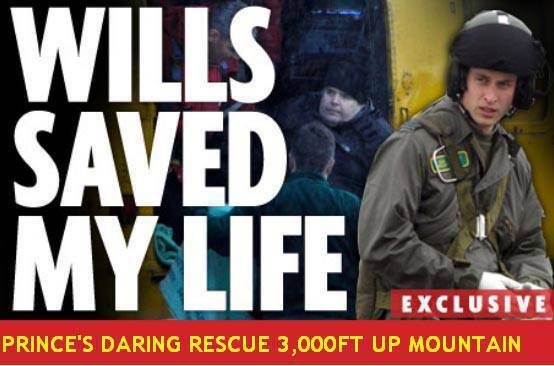 "If it wasn’t for him and the rest of his crew, I’d be dead," Watkins, 45, told the Sunday Mirror. "Hearing his helicopter getting nearer and nearer was the best sound I’ve ever heard. He and his crew saved my life." "He’d probably say he was just doing his job but to me, he and his crew are heroes. The weather was appalling up on that mountain. How he managed to get the helicopter so close defies belief. The fog was so thick at times, you couldn’t see your hand in front of your face. The rain was lashing down and it was howling a gale," Watkins said. He added that "having been rescued by the future King of England" did not "sink in" until after his operation. Prince William, 28, is known as Flight Lieutenant Wales in the military, according to the AFP. For more on this story, log on to Yahoo News and Mirror.co.uk.